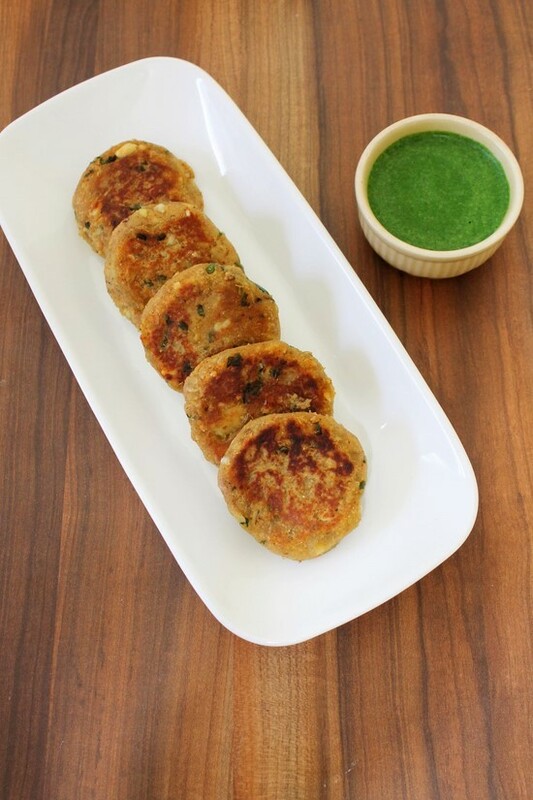 Sweet potato tikki or patties recipe – it is the perfect snack for Navratri fast or ekadashi vrat. It is filling and delicious. If you like hint of sweetness in your savoury food then this is for you. Lemon juice is added which balance out the sweet flavor of the sweet potatoes. **Note: While making this sweet potato tikki, I have added chaat masala. I have used special homemade chaat masala which can be consumed on vrat. As store bought chaat masala has already added regular salt in it. And this regular salt in not allowed while fasting. So my mom always makes fasting chaat masala using sendha namak or rock salt. You can skip the addition of chaat masala in the recipe. During the Navratri fasting or vrat, people eat farali food and potato is most common ingredient in most dishes. So sometimes I get tired of having potatoes in every meal. That time sweet potato gives nice change and different taste. But of course you can make the same recipe with regular potatoes and will be called aloo tikki instead. 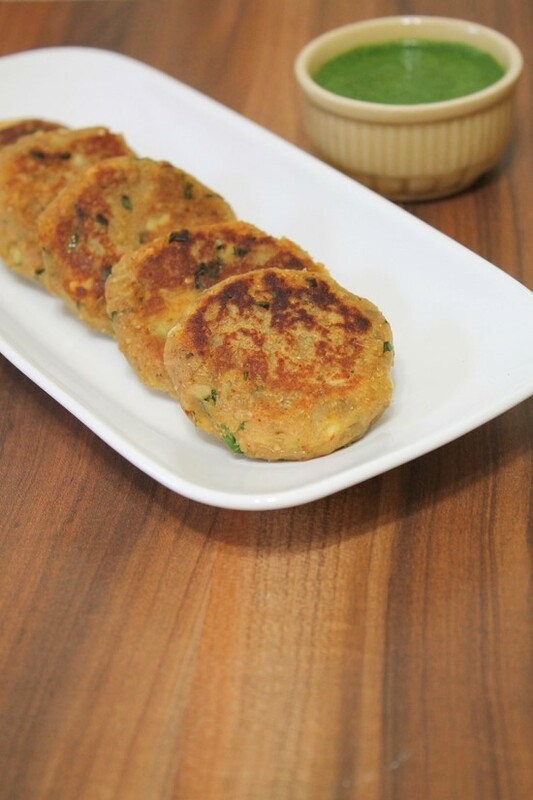 Shakarkandi ki tikki is very easy to make and requires very less effort. Other than tikkis I use sweet potatoes in other recipes too. And sometimes I like to snack on steamed sweet potato. It is my childhood favorite snack on fasting days. 1) Wash sweet potatoes, take into pressure cooker with enough water so they are submerged in the water. Cover the lid, put the weight on and cook it on medium heat for 5-6 whistles. Number of whistles and cooking time purely depends on the size of the sweet potato, so cook accordingly. 2) Let the pressure go down by itself, drain all the water and let the them cool to touch. Then remove the skin. 3) Roughly cut into pieces and take into a bowl. 4) Now mash it with potato masher. 5) Add all the spice powders (amchur powder, chaat masala, cumin powder, red chili powder, fennel seeds powder and sendha namak) along with chopped green chilies, cilantro leaves and crushed peanuts. 6) Squeeze the lemon juice on it. and mix it well. 7) It might be very soft. If needed add singhare ka atta or rajgira atta or kuttu ka atta (any fasting flour) and mix it. 8) The quantity of the flour depends on the sweet potato type and how much moisture is present in it. Only add enough flour so that you are able to form the tikkis. 9) Now grease your hands with oil or ghee. and start shaping the tikkis. 10) Shape all the tikkis. If you are serving it right away then start shallow frying or you can cover it with plastic wrap and keep it in refrigerator till needed. 11) Heat few tablespoons of oil in a nonstick pan on medium heat. Once hot place the tikkis and fry. 12) Once get light brown from the bottom side the flip it and cook on other side as well. Remove it to a plate and serve. Serving suggestions: If serving these sweet potato tiikis on vrat or fasting days, have phalahari or farali chutney on side. If serving on regular day then enjoy it with your choice of chutney or ketchup. Wash sweet potatoes, take into pressure cooker with enough water so they are submerged in the water. Cover the lid, put the weight on and cook it on medium heat for 5-6 whistles. Number of whistles and cooking time purely depends on the size of the sweet potato, so cook accordingly. Let the pressure go down by itself, drain all the water and let the them cool to touch. Roughly cut into pieces and take into a bowl. Now mash it with potato masher. Add all the spice powders, sendha namak along with chopped green chilies, cilantro leaves and crushed peanuts. Squeeze the lemon juice on it. and mix it well. It might be very soft. If needed add singhare ka atta or rajgira atta or kuttu ka atta (any fasting flour) and mix it. Now grease your hands with oil or ghee. and start shaping the tikkis. Heat few tablespoons of oil in a nonstick pan on medium heat. Once hot place the tikkis and fry. Once get light brown from the bottom side the flip it and cook on other side as well. Remove it to a plate and serve. very glad to know that you liked these tikkis and other recipes. Please share your feedback if you have tried any other recipe. Great taste. ..kids liked it with tomato ketchup. .
My tikki was lil bit loose..so I added 1 more spoon of rajgara flour. Also I didn’t had shingada flour. So used rajgara flour only. Does it need more cooking time then? It also wasn’t possible to cook for longer, as getting black spots easily! ! Good to know it came out tasty. even if any flour added, No need to cook longer. Thanks for the reply will be waiting for that post. thanks for sharing. if you know the recipe for buffwada ( a very popular in Ahmedabad) please share with us and also koya kaju recipe as I requested earlier. I know you requested Khoya kaju recipe. I won’t be able to post in couple of weeks, but for sure I will share it before Diwali. Thank you for your patience. I was about to send you message that where are you , and thought let me check her blog and i message her, and found u here, love this tikki, without fasting also we can make this and enjoy it. Thanks Linsy. That is true, we can make this on regular day as well. Even I made it and enjoyed on non-fasting day and took the photos.